The Triumph Street Cup 2017 edition was introduced to the world without much fanfare. This is a shame as the motorcycle is an excellent one. 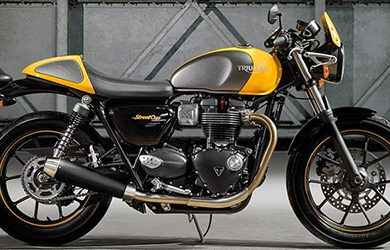 The bike is the latest version of Street Twin format. The latter was first released in 2015. It is so good that its name can be shouted from the rooftops. The Triumph claims that the dry weight of the Street Cup is 200 kilograms. This means 440 pounds. It can be safely assumed that the bike weighs an extra 25 kilograms or 55 pounds when full of fuel. The tank holds 12 litres of petrol. Contrary to popular perception, the bike is not that heavy. The weight is not noticeable. The bike is excellently balanced and the weight is kept at the lower end of the scale. The only problem is the motorcycle's restrictive steering stop. It means that the tight manoeuvres are harder than they should be. The Street Cup is best suited for urban riding. The handlebar mirrors stick out more than they ideally should. If you do not notice, they will soon bang into things in small gaps. The riding position is not too much uncomfortable. The pegs are in the same place as its sibling Street Twin. This Triumph model is sporty, but not uncomfortably so. A tall person can feel cramped after a few hours of riding. What sets the motorcycle apart is the sound of the exhaust. It is extremely addictive. The sound is not loud enough to disturb the neighbours, but audible enough when the sound bounces off the surrounding cars. The first gear and the second gear are enough to ride around in the city. The five speed gearbox is accurate but not as slick as available on the more expensive models in the Triumph stable. The gearbox, however, is much better than its competitors. The claimed maximum torque is 59 lb-ft or 80nm. It is seen a little below 4000 rpm. This means it can be easily enjoyed from the stop lights. The Triumph Street Cup performs excellently on the highway as well. The torque is well produced. The 54 horsepower delivered by a 900cc motorcycle is adequate. The street cup's torque accessibility is one major reason as to why it is so. These may not be an excellent quantity of power, but all of it is available for use. The Triumph Street Cup is definitely not a touring bike. Not much protection is offered by the small screen. The seating position is a tiring one for tall riders. There is not much space to put luggage. What's more the fuel light turns on only after 120 miles. Shorter rides are more a forte for this thing. The engine spins at about 4500 rpm at 80 mph. If you want to extract more speed, then the bike will lose power. Doing a century per hour demands the rider to widely open the throttle at the sight of a straight road.